BURGLARY 6/4 S. Roosevelt Ave.
Todd R. Alloway, 30, of New Gretna, was arrested by Ofc. Carolyn Buckley for DWI following a single car accident on June 2nd. Darnell N. Reynolds, 40, of Pleasantville, was arrested by Ofc. Przemyslaw Ryba for hindering apprehension on June 2nd. Rebekka J. Bailey, 25, of Egg Harbor, was arrested by Ofc. Scott Winneberger for possession of heroin on June 2nd. Jerrell R. Draughn, 32, of Pleasantville, was arrested by Ofc. Przemyslaw Ryba for DWI and possession of CDS on June 3rd. Patrice A. Dowe, Jr., 18, of Galloway, was arrested by Det. Ryan Goehringer for robbery and hindering apprehension on June 4th. Edward Frost, 43, of Galloway, was arrested by Ofc. John Mooney for aggravated assault on June 4th. Carlos O Oliva-Diaz, 21, of Pleasantville, was arrested by Ofc. Jackie Crocker for hindering apprehension. Adam J. Rosen, 29 of Galloway, and Kathryn A. O’Neill, 24, Damon R. Zeak, 19, and Ashley L. Gibbons, 23, all of Hamilton Twp., were arrested by Ofc. Scott Winneberger for possession of heroin on June 6th. O’Neill was also charged with possession of hypodermic needles. Edward H. Campbell, 60, of Voorhees, was arrested by Ofc. Scott Winneberger for DWI and driving while suspended from 2 previous DWIs on June 6th. 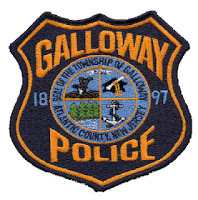 John L. Manwaring, Jr., 50, of Galloway, was arrested by Ofc. Scott Winneberger for aggravated assault, possession of a weapon for unlawful purpose, terroristic threats and criminal trespass on June 6th. Heather A. Kelly, 32, of Pleasantville, was arrested by Ofc. Justin Butler for DWI and criminal mischief on June 8th. A 17 year old Atlantic City boy was charged by Ofc. Christian Magazzu with eluding by fleeing in a vehicle and taking a vehicle without owner’s consent.